Cody Nance hopes to make his mental game a strength in the stretch run to the world title. Photo: Andy Watson/BullStockMedia.com. PUEBLO, Colo. – Cody Nance was explaining the importance of having a strong mindset in the face of adversity last month when 2016 World Champion Cooper Davis pivoted in the hallway to jump into the conversation. “A lot of it is finding things that will bring you down and using them to build you up,” Davis said in Tulsa, Oklahoma. Nance has been spending time this season reading portions of the book “The Champion’s Mind: How Great Athletes Think, Train and Thrive” by Jim Afremow. Afremow – a sports psychologist – offers readers the same advice that he does to Olympians, Heisman Trophy winners and professional athletes. Some of the areas of focus include how to get in a zone, thrive on a team, stay humble, progress within a sport and sustain long-term excellence. Nance said the book has helped him continue to remember that the 2018 World Championship race is a process, not just a destination. However, Nance has hit some adversity with only six regular season events remaining. The No. 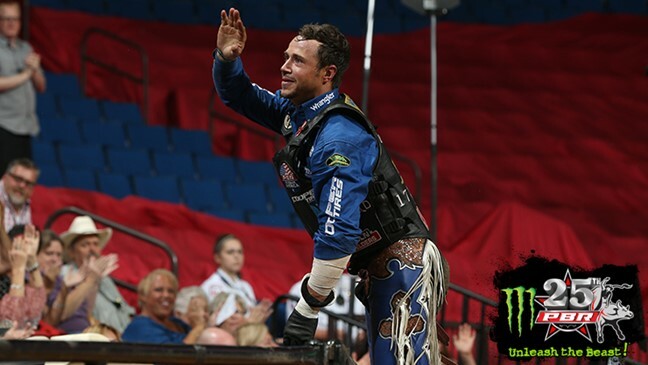 5 and highest-ranked American in the world standings heads into the Atlantic City Invitational with six consecutive buckoffs since his third-place finish in Tulsa. Nance’s buckoff streak has coincided with world leader Kaique Pacheco’s recent surge, which has dropped Nance 1,379.17 points behind the No. 1 bull rider in the world. The 30-year-old will need to channel some of his lessons learned from the book this weekend as he tries to make up some ground on Pacheco. Nance has drawn Bugle Boy (3-2, PBR UTB) for Round 1 on Saturday night. The Paris, Tennessee, cowboy is 28-for-60 (46.67 percent) compared to Pacheco’s 28-for-61 season. The difference has been that Pacheco has a PBR Major win, a three-day event win and three 15/15 Bucking Battle titles. Nance has one three-day event victory, a 15/15 Bucking Battle win and one two-day event title. Nance’s latest buckoff was a 7.2-second stinger aboard Pick-It Construction’s Find Jesus last weekend in Springfield, Missouri. Nance knows he belongs in the World Champion conversation with Pacheco and the other contenders. Nance and Davis were the first two selections by Team USA Eagles coach McBride for the WinStar World Casino & Resort 2019 Global Cup USA. Davis is also still in contention for the 2018 world title. The fourth-year pro is 1,785 points behind Pacheco heading into his Round 1 matchup against Jesus & Bocephus (5-1, PBR UTB). The Jasper, Texas, cowboy said it can be a lethal combo if Nance can take that mental fortitude approach and turn it into 8-second rides. “That is scary now that Nance is reading that book,” Davis concluded.